Cooking in foil packs is popular among campers and there are several good reasons why. It’s convenient because you can prepare the meal ahead of time and cook everyone’s individual meal packs when you are ready. You also save your self a lot of dish washing after dinner when everything is cooked in these easy foil packs. There is a broad variety of foods that can be cooked in foil packs, from breakfast to dessert. You can add cubed potatoes, slices of bacon, some tasty bits of onion and wrap it all up for a delicious breakfast. Dinner can be a blend of cubed, ham, sweet potato, and pineapple. For something sweet, try some cinnamon dusted peach halves. 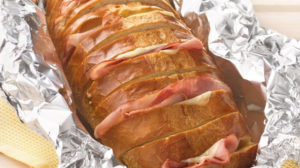 You can slice a loaf of french bread and fill it with favorites as well. The combinations are limited only by your imagination. Choose any meat, fish, veggies, or fruit that you enjoy and wrap it up in foil. You can cook them over the coals of your campfire and avoid standing over a stove. Perfect for getting more play time out of your vacation. You can find some easy recipes to try at 18 Simple & Tasty Tin Foil Camping Recipes. You can even make them ahead and freeze them.